Over the years, homemaking in the United States has been a foundational piece of the education system, particularly for women. These homemaking courses, called home economics, have had a prevalent presence in secondary and higher education since the 19th century. By definition, home economics is “the art and science of home management”, meaning that the discipline incorporates both creative and technical aspects into its teachings. Home economics courses often consist of learning how to cook, how to do taxes, and how to perform child care tasks. In the United States, home economics courses have been a key part of learning the art of taking care of a household. One of the first to champion the economics of running a home was Catherine Beecher, sister to Harriet Beecher Stowe. Since the 19th century, schools have been incorporating home economics courses into their education programs. In the United States, the teaching of home economics courses in higher education greatly increased with the Morrill Act of 1862. Signed by Abraham Lincoln, the Morrill Act of 1862 granted land to each state or territory in America for higher educational programs in vocational arts, specifically mechanical arts, agriculture, and home economics. Such land grants allowed for people of a wider array of social classes to receive better education in important trade skills. Home economics courses mainly taught students how to cook, sew, garden, and take care of children. The vast majority of these programs were dominated by women. Home economics allowed for women to receive a better education while also preparing them for a life of settling down, doing the chores, and taking care of the children while their husbands became the breadwinners. At this time, homemaking was only accessible to middle and upper class white women whose families could afford secondary schooling. In the late 19th century, the Lake Placid Conferences took place. The conferences consisted of a group of educators working together to elevate the discipline to a legitimate profession. Originally, they wanted to call this profession "oekology", the science of right living. However, "home economics" was ultimately chosen as the official term in 1899. Home economics in the United States education system increased in popularity in the early 20th century. It emerged as a movement to train women to be more efficient household managers. At the same moment, American families began to consume many more goods and services than they produced. To guide women in this transition, professional home economics had two major goals: to teach women to assume their new roles as modern consumers and to communicate homemakers’ needs to manufacturers and political leaders. The development of the profession progressed from its origins as an educational movement to its identity as a source of consumer expertise in the interwar period to its virtual disappearance by the 1970s. An additional goal of the field was to “rationalize housework”, or lend the social status of a profession to it, based on a theory that housework could be intellectually fulfilling to women engaged in it, along with any emotional or relational benefits. In 1909, Ellen Swallow Richards founded the American Home Economics Association (now called the American Association of Family and Consumer Sciences). From 1900 to 1917, more than thirty bills discussed in Congress dealt with issues of American vocational education and, by association, home economics. Americans wanted more opportunities for their young people to learn vocational skills and to learn valuable home and life skills. However, home economics was still dominated by women and women had little access to other vocational trainings. As stated by the National Education Association (NEA) on the distribution of males and females in vocations, “one-third of our menfolk are in agriculture, and one-third in non-agricultural productive areas; while two-thirds of our women are in the vocation of homemaking”. Practice homes were added to American universities in the early 1900s in order to model a living situation, although the all-women ‘team’ model used for students was different from prevailing expectations of housewives. For example, women were graded on collaboration, while households at the time assumed that women would be working independently. Nevertheless, the practice homes were valued. These practicum courses took place in a variety of environments including single-family homes, apartments, and student dorm-style blocks. For a duration of a number of weeks, students lived together while taking on different roles and responsibilities, such as cooking, cleaning, interior decoration, hosting, and budgeting. Some classes also involved caring for young infants, temporarily adopted from orphanages. Childcare practicums were often included at the same time as other classwork, requiring students to configure their intellectual and home lives as compatible with one another. According to Megan Elias, “in the ideal, domestic work was as important as work done outside the home and it was performed by teams of equals who rotated roles. Each member of the team was able to live a life outside the home as well as inside the home, ideally, one that both informed her domestic work and was informed by it. This balance between home and the wider world was basic to the movement”. There was a great need across the United States to continue improving the vocational and homemaking education systems because demand for work was apparent after World War I and II. Therefore, in 1914 and 1917, women's groups, political parties, and labor coalitions worked together in order to pass the Smith-Lever Act and the Smith-Hughes Act. The Smith-Lever Act of 1914 and the Smith-Hughes Act of 1917 created federal funds for "vocational education agriculture, trades and industry, and homemaking" and created the Office of Home Economics. With this funding, the United States was able to create more homemaking educational courses all across the country. Throughout the 1940s, Iowa State College (later University) was the only program granting a master of science in household equipment. However, this program was centered on the ideals that women should acquire practical skills and a scientifically based understanding of how technology in the household works. For example, women were required to disassemble and then reassemble kitchen machinery so they could understand basic operations and understand how to repair the equipment. In doing so, Iowa State effectively created culturally acceptable forms of physics and engineering for women in an era when these pursuits were not generally accessible to them. A Home Economics class receiving instruction in cooking, Ottawa, Ontario, 1959. Throughout the latter part of 20th century, home economics courses became more inclusive. In 1963, Congress passed the Vocational Education Act, which granted even more funds to vocational education job training. Home economics courses started being taught across the nation to both boys and girls by way of the rise of second-wave feminism. This movement pushed for gender equality, leading to equality of education. In 1970, the course became required for both men and women. Starting in 1994, home economics courses in the United States began being referred to as "family and consumer science" in order to make the class appear more inclusive. With desegregation and the Civil Rights Act of 1964, men and women of all backgrounds could equally how to sew, cook, and balance a checkbook. In the 1980s, "domestic celebrities" rose to stardom. Celebrities, such as Martha Stewart, created television programs, books, magazines, and websites about homemaking and home economics, which attested to the continued importance of independent experts and commercial mass-media organizations in facilitating technological and cultural change in consumer products and services industries. Present day, the prevalence of home economics courses has declined. Instead, schools are focusing more on courses that prepare one for university rather than life skills. Also, homemaking and home economics courses have developed a negative connotation because of the negative gender bias associated with home economics courses. Despite this, homemaking is now socially acceptable for both men and women to partake in. In the United States, both men and women are expected to take care of the home, the children, and the finances. More women are pursuing higher education rather than homemaking. In 2016, 56.4% of college students were female as opposed to 34.5% in 1956. Some schools are starting incorporate life skill courses back into their curriculum, but as a whole, home economics courses have been in major decline in the past century. FCS is taught worldwide, as an elective or a required course in secondary education, and in many tertiary and continuing education institutions. Sometimes it is also taught in primary education. International cooperation in the field is coordinated by the International Federation for Home Economics, established in 1908. In the majority of elementary (K-6) and public (K-8) schools in Canada, home economics is not taught. General health education is provided as part of a physical education class. In High Schools or Secondary Schools, there is no specific home economics course, but students may choose related courses to take, such as Family Studies, Food and Nutrition, or Health and Safety. 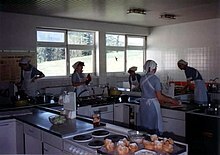 In Scotland, Home Economics was replaced by Hospitality: Practical Cooking at National 3,4 and 5 level and Health and Food Technology at National 3, 4, 5, Higher and Advanced Higher. The awarding body is the SQA. ^ a b "FAQ". American Association of Family and Consumer Sciences. Archived from the original on 2015-01-11. Retrieved 2015-01-11. ^ "Why the Change to Human Ecology?". Cornell University. Retrieved 20 November 2012. ^ "the definition of home economics". www.dictionary.com. Retrieved 2019-03-19. ^ "IFHE Position Statement on Home Economics". www.ifhe.org (in German). Retrieved 2019-03-19. ^ Biester, Charlotte E. (1952). "Catharine Beecher's Views of Home Economics". History of Education Journal. 3 (3): 88–91. ISSN 0162-8607. ^ Read "Colleges of Agriculture at the Land Grant Universities: A Profile" at NAP.edu. ^ a b "Encyclopedia of the Great Plains | WOMEN IN HIGHER EDUCATION". plainshumanities.unl.edu. Retrieved 2019-03-19. ^ a b "AAFCS Brand Story" (PDF). American Association of Family & Consumer Sciences. Archived from the original (PDF) on 8 September 2013. Retrieved 20 November 2012. ^ Goldstein, Carolyn M., 2012. Dust jacket. Creating Consumers: Home Economists in Twentieth-Century America. Chapel Hill: The University of North Carolina Press. ^ a b c Elias, Megan (January 2006). ""Model Mamas": The Domestic Partnership of Home Economics Pioneers Flora Rose and Martha Van Rensselaer". Journal of the History of Sexuality. 15 (1): 65–88. JSTOR 4617244. ^ Hillison, John (1995). "The Coalition that Supported the Smith-Hughes Act or a Case for Strange Bedfellows". Journal of Vocational and Technical Education. 11 (2): 4–11. ISSN 0010-3829. ^ "America at Century's End". publishing.cdlib.org. Retrieved 2019-03-19. ^ Alexander, Kern; Salmon, Richard G.; Alexander, F. King (2014-09-15). Financing Public Schools: Theory, Policy, and Practice. Routledge. ISBN 9781135106560. ^ Goldstein, Carolyn M., 2012. Page 36. Creating Consumers: Home Economists in Twentieth-Century America. Chapel Hill: The University of North Carolina Press. ^ Bix, Amy Sue (October 2002). "Gendered Technical Training and Consumerism in Home Economics, 1920-1980". Technology and Culture. 43 (4). ^ "ERIC - Education Resources Information Center". eric.ed.gov. Retrieved 2019-03-19. ^ Kjaersgaard, Edith (1973). "Home Economics and the Changing Roles of Men and Women". International Review of Education / Internationale Zeitschrift für Erziehungswissenschaft / Revue Internationale de l'Education. 19 (1): 125–127. ISSN 0020-8566. ^ Jacobson, Lisa (2014-12-01). "Creating Consumers: Home Economists in Twentieth-Century America. By Carolyn M. Goldstein (Chapel Hill: The University of North Carolina Press, 2012. xi plus 412 pp.)". Journal of Social History. 48 (2): 452–454. doi:10.1093/jsh/shu099. ISSN 0022-4529. ^ "Public School Desegregation in the United States, 1968 - 1980 — The Civil Rights Project at UCLA". www.civilrightsproject.ucla.edu. Retrieved 2019-03-19. ^ Goldstein, Carolyn M., 2012. Page 299. Creating Consumers: Home Economists in Twentieth-Century America. Chapel Hill: The University of North Carolina Press. ^ Rhodes, Jesse. "Is Home Economics Class Still Relevant?". Smithsonian. Retrieved 2019-03-19. ^ "What Was Home Economics? -". rmc.library.cornell.edu. Retrieved 2019-03-19. ^ "SAGE Journals: Your gateway to world-class journal research". SAGE Journals. doi:10.1177/0268580906059294. Retrieved 2019-03-19. ^ "Digest of Education Statistics, 2017". nces.ed.gov. Retrieved 2019-03-19. ^ Noddings, Nel (2013). Education and Democracy in the 21st Century. Teachers College Press. ISBN 9780807753965. ^ "About IFHE". International Federation for Home Economics. Archived from the original on 2014-12-07. Retrieved 2015-01-11. ^ 가정과학대학 70년사 (Gajeonggwahakdaehak 70-nyeonsa / 70 Years of the College of Family Science). Ewha Womans University Press. 1999. p. 7. ISBN 9788973003839. ^ "SCHEME OF EXAMINATIONS AND PASS CRITERIA". cbse.nic.in. Lee, Tsz Ngong (1999). "Home Economics". In Altenbaugh, Richard J. (ed.). Historical Dictionary of American Education. Greenwood Press. pp. 175–176. ISBN 031328590X. Walker, Melissa (1998). "Home Economics". In Eisenmann, Linda (ed.). Historical Dictionary of Women's Education in the United States. pp. 201–206. ISBN 0313293236.